When I initially proposed the idea of Mobile First over three years ago, there were a lot of skeptics. The situation today has a lot more people convinced that taking mobile seriously matters. But just in case some people remain unconvinced, here's a really vivid way of explaining the situation. Looking at the total of iOS devices (iPhones plus iPads and iPod Touches) sold per day brings the total of Apple mobile devices sold per day to 562,000. 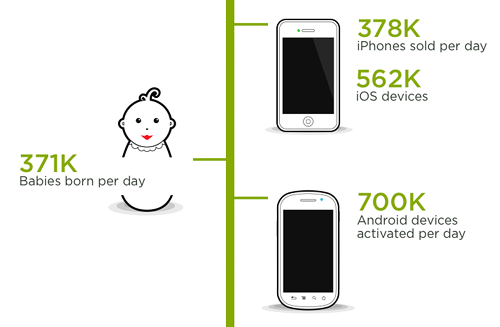 Together with Android devices that's 1.27M mobile devices sold or activated per day compared to 371,124 children born. But there's more. Nokia sold 200,000+ smartphones a day (and 958k feature phones). RIM sold 143,000 Blackberries a day at the end of 2011. 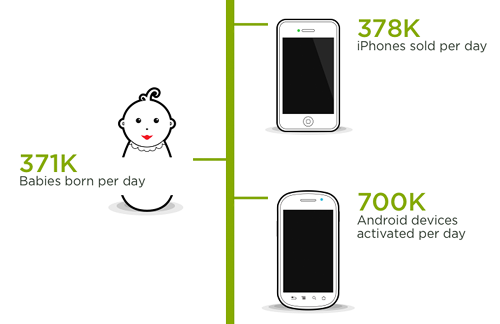 This brings the total of smartphones entering the World per day to about 1.45M devices again compared to 317,124 births. 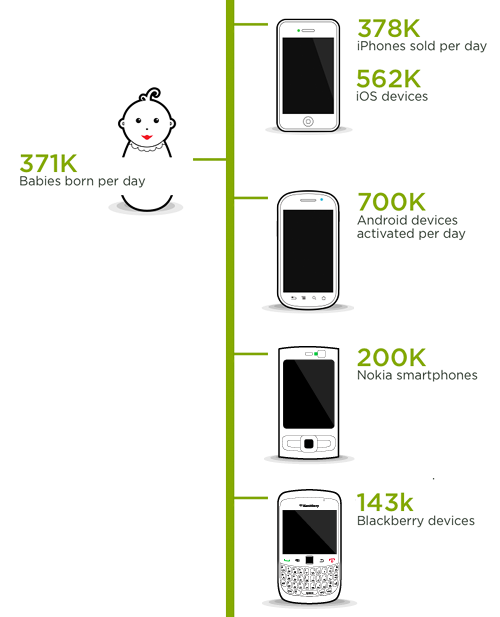 Clearly there's a lot of mobile devices coming into the World. 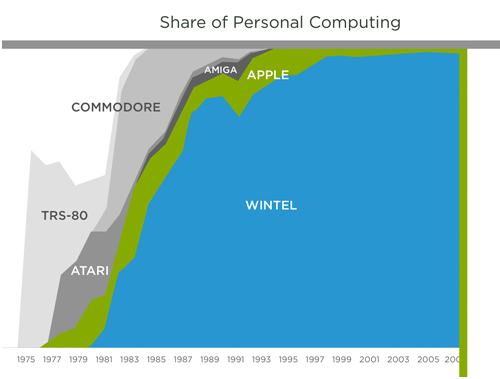 That's having a huge impact on the personal computing market. 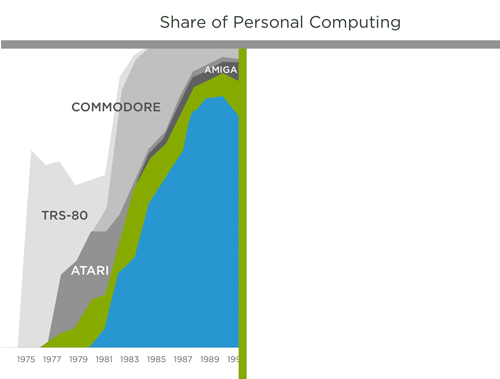 Looking at data compiled by Asymco, the first 15 years of personal computing consisted of a few manufacturers trying to figure things out (Amiga, Atari, Apple). The next 15 years were completely dominated by Microsoft's WinTel platform with Apple barely hanging on. Fast forward to the past 3 years and you can see a huge shift underway. 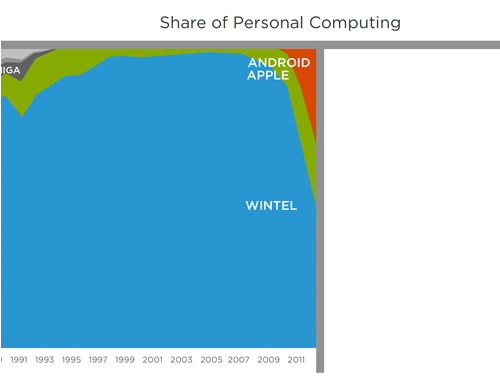 Apple and Android are eating into personal computing in a massive way. That's because today's mobile devices aren't just phones they're the most personal form of computer we have: always with us, always connected, and highly capable. eBay has seen a similar trend. 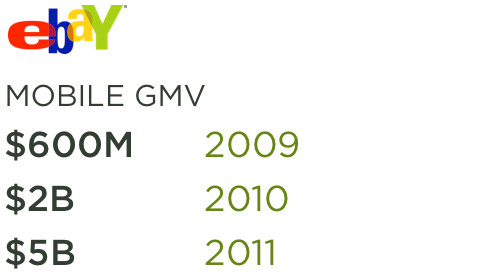 eBay reached $5 billion in mobile GMV (gross merchandise volume) in 2011, more than doubling 2010′s GMV of $2 billion. 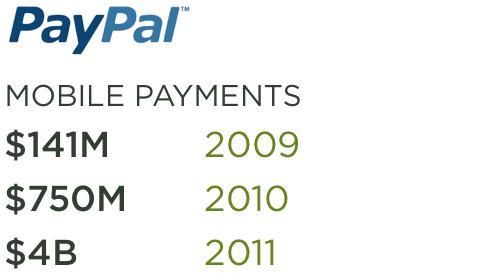 This was up from $600 million in 2009. Hopefully this sample of data points helps some mobile skeptics see the opportunity we're facing. If you need even more convincing check out my ongoing series of data posts for a deeper look at the mobile market and beyond.